Figure 1: PEEK repeat unit, showing ketone and ether functional groups. Titanium, the current state of the art for bone implants, has a Young's modulus of 110 GPa, while compact bone has a modulus of only 18 GPa . This leads to a phenomenon called stress shielding, where an implant with Young's modulus higher than that of bone bears a majority of the stress, causing the bone to be resorbed . Titanium is also opaque under x-ray imaging and interferes with computer tomography (CT) scanning and magnetic resonance imaging (MRI), hindering efforts to study implant effectiveness . Figure 2: Zirconium oxide layer coordinated to PEEK surface functionalities by chemical vapor deposition (CVD). Unfortunately, osteoblasts and other cells do not adhere well to unmodified PEEK surfaces . Successful implants require attachment of native tissue for enhanced structural attachment, so PEEK surfaces must be modified to improve cell adhesion. Figure 3: Self-assembled monolayer (SAM) of bisphosphonic acid formed on top of zirconium oxide layer. Both treatments successfully penetrated 5 mm into a porous PEEK test device. X-ray photoelectron spectroscopy (XPS) confirmed the presence of phosphorus 2p and zirconium 3d peaks equally at the center and periphery of the device (Figure 4). Figure 4: XPS data showing permeation of surface treatments to the center of the PEEK porous test device. Figure 5: Angled test piece manufactured using selective laser sintering (SLS) showing high surface roughness incompatible with cell adhesion assays. The high surface roughness of SLS parts also makes alignment with microscope focal planes difficult. When this obstacle is combined with the autofluorescence of PEEK , fluorescence microscopy becomes untenable. Finding no evidence of cell adhesion or growth was found by SEM, the focus of the research shifted to cell adhesion and migration assays on PEEK machined using traditional methods. Following deposition of cell-adhesive coatings on machined PEEK, an assay was performed to characterize cell adhesion and migration. 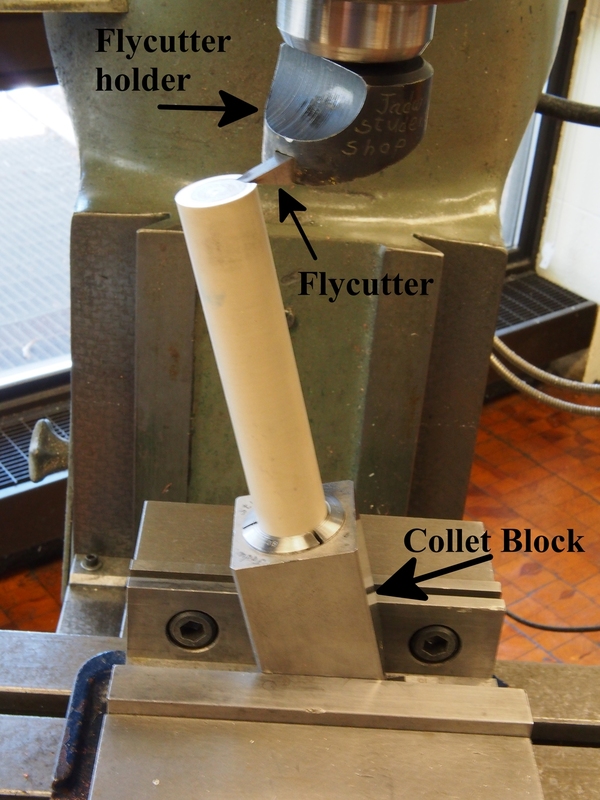 "Conical cup" devices were created with a custom lathe tool. The control devices had a single conical surface at an angle of 25° from flat (Figure 6). The assay devices had two conical surfaces inside the cup: one surface at 25° from flat and one at 55° from flat, making a 30° angle between the surfaces (Figure 7). The first surface was created by moving the lathe tool with the compound slide. The second surface was created by the edge of the cutting tool, where the tool block was rotated to the appropriate angle (Figure 8). 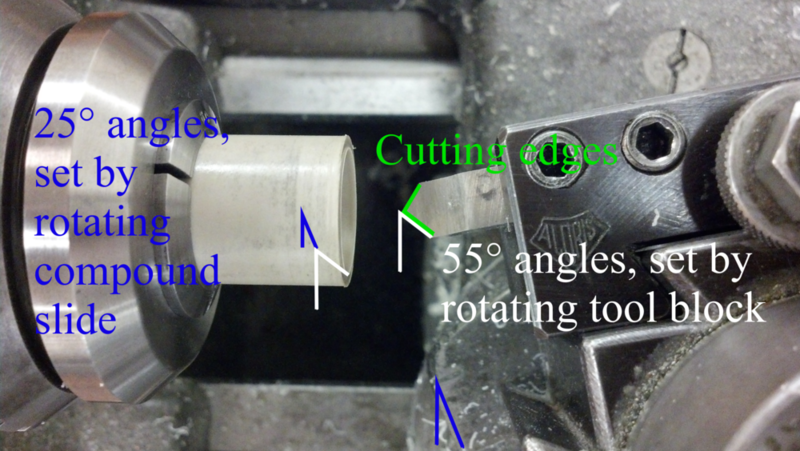 Figure 8: Machining process for conical cup devices. A custom lathe tool mounted on a rotated tool block, provided one angled surface, while the motion of the compound slide provided the other. Figure 9: Plating wells with conical cup devices, showing medium communicating through the cut channel. Figure 10: Initial plating step, showing cell media partly covering the lower surface of the device without reaching the critical angle. Cell seeding, fixing, and permeabilization were performed by Stephen Bandini and Patrick Donnelly from the group of Professor Jeffrey Schwartz, using the laboratory facilities of Professor Jean Schwarzbauer. With conical cup substrates, 10,000 cells were plated in 150 μl Dulbecco’s Modified Eagle Medium (DMEM) with serum in a single drop at the center of the cup. The space in the well around the substrate was filled with a predetermined volume of medium until the two liquids communicated via a cut channel (Figure 9). Cells were allowed to attach at 37 °C for 3 hr, with media only covering half of the base region of the device (Figure 10) to prevent plating cells on or above the critical angle. The media was then suctioned off and the devices were rinsed twice with PBS. The wells were filled with DMEM with 10% calf serum until the devices were completely submerged. This step allowed any cells that attached during the plating step to migrate and spread for an additional 3 days (Figure 11). Figure 11: Migration step, showing the plating well filled with medium after suctioning and rinsing. Cells that adhered on the lower surface of the device migrate across the critical angle. Cells were fixed using 3.7% formaldehyde in PBS for 15 min, and permeabilized with 0.5% NP-40 detergent in PBS for 15 min at room temperature. Next, cell samples were dried successively in 10, 30, 50, 70, 90% ethanol solutions in deionized water, then in 1:1 tetramethylsilane (TMS):ethanol and pure TMS, for 5 min each. Samples were air dried from TMS solution in a fume hood. Progress of cell migration was determined by SEM (Figure 11), by visually locating the furthest cells from the center of the cup. Preliminary results indicated that fibroblasts could adhere and migrate over surface obstacles against gravity on a PEEK surface machined using conventional techniques. There is no apparent difference in cell microstructure (Figure 12) on the three different surface chemistries. Cells appear equally well-spread, indicating that the roughness and features of the plain, zirconated, and phosphonated surfaces are similar. This helps show that the oxide layer is surface-conforming, as the cells adhere to the underlying surface grooves in the same way. Figure 12: SEM micrograph of NIH 3T3 fibroblasts adhered to machined PEEK surfaces. Microstructures appear identical for PEEK with (a) no surface treatment, (b) zirconium oxide layer, (c) bisphosphonic acid monolayer. Cell migration fronts (Figure 13) were observed at the following distances: 3.0 mm on the 30° plain PEEK device, 3.3 mm on the 30° zirconated PEEK device, and 4.8 mm on the 0° phosphonated PEEK device. Figure 13: Migration fronts for devices that showed evidence of cell adhesion. This result is interpreted with care due to inaccuracies in the plating process. Cells were not observed on the remaining devices. This may be due to irregularities in cell concentration in the plating volume. Alternatively, when the cell plating volume communicated with the media surrounding the conical cup, cells may have been drawn out with fluid flow through the channel. 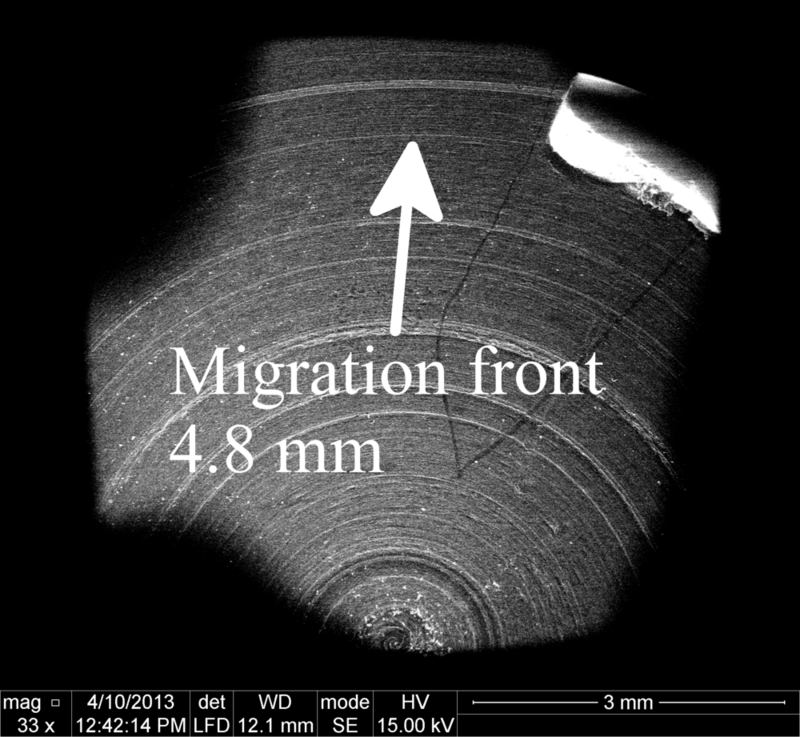 The migration front distance result is interpreted with care: during the initial plating, the droplets spread differently on the surfaces according to their wetting properties. The droplet even reached the critical angle on the 30 phosphonated PEEK device during the initial plating step. To improve this cell assay experiment, the next step in imaging would be to stain the samples with a dye of longer wavelength, such as 647 nm. This would serve two purposes: enhanced microstructure analysis and more rapid counting of adherent cells. By selecting stains for various cytoskeletal components, the nature of skeletal stresses and focal adhesions could be investigated on each surface type. With clear distinction between the device surface and the fluorescence of stained cells, these cells could be counted in a large field of view. Alternatively, future work could explore Nylon 12 as an alternative material for these experiments, as it does not autofluoresce. XPS of a Nylon 12 coupon treated by CVD and LE indicated zirconium and phosphorus on the surface. This material is attractive as it has favorable material properties: though it is not as strong as PEEK, it still exhibits a Young’s modulus of about 2 GPa. The next refinements in cell adhesion steps would be to plate cells at a higher density for a longer initial period of time, in a smaller volume of media. Also, the migration experiment would be run for a longer period of time after the removal of unadhered cells. These modifications would prevent the initial cell plating volume from reaching the critical angle, while favoring a cell migration front farther from the center of the device, ideally reaching and traversing the critical angle. Also, these modifications would lead to a more radially uniform cell migration front. S. M. Kurtz and J. N. Devine. PEEK biomaterials in trauma, orthopedic, and spinal implants. Biomaterials, 28(32):4845–4869, 2007. R. Huiskes, H. Weinans, and B. van Rietbergen. 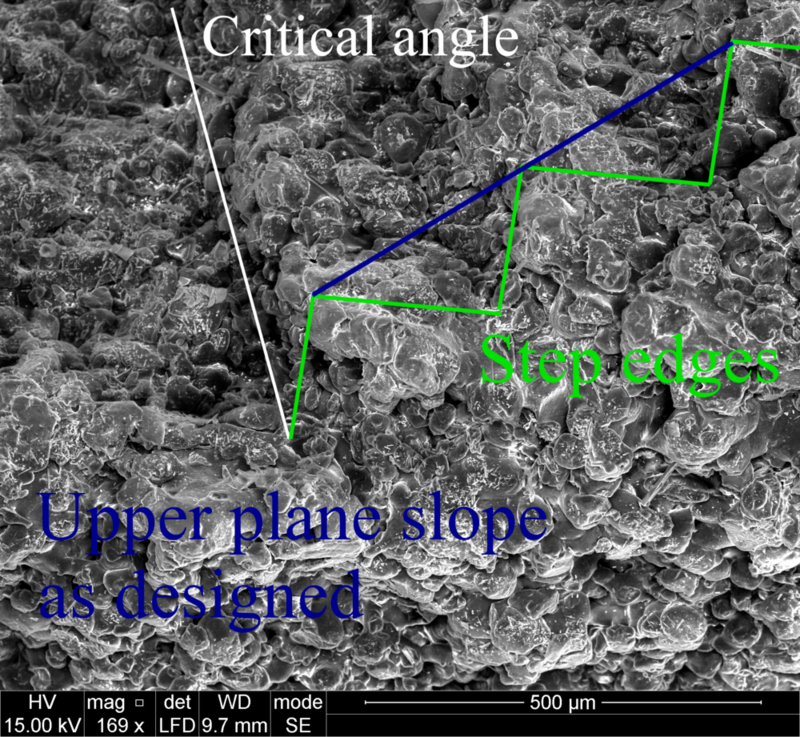 The relationship between stress shielding and bone resorption around total hip stems and the effects of flexible materials. Clinical Orthopaedics and Related Research, (274):124–34, 1992. P. T. Knott, S. M. Mardjetko, R. H. Kim, et al. A comparison of magnetic and radiographic imaging artifact after using three types of metal rods: stainless steel, titanium, and vitallium. Spine Journal, 10(9):789–794, 2010. D. F. Williams, A. Mcnamara, and R. M. Turner. Potential of Polyetheretherketone (Peek) and Carbon-Fiber-Reinforced Peek in Medical Applications. Journal of Materials Science Letters, 6(2):188–190, 1987. Derek Korn. A Quick Look At PEEK Machining. Modern Machine Shop, 80(1):84– 86, 2007. O. Noiset, Y. J. Schneider, and J. Marchand-Brynaert. Adhesion and growth of CaCo2 cells on surface-modified PEEK substrata. Journal of Biomaterials Science, Polymer Edition, 11(7):767–786, 2000. T. J. Dennes and J. Schwartz. A Nanoscale Adhesion Layer to Promote Cell Attachment on PEEK. Journal of the American Chemical Society, 131(10):3456–3457, 2009. Jasmin Althaus, Celestino Padeste, Joachim Köser, et al. Nanostructuring polyetheretherketone for medical implants, 2012.